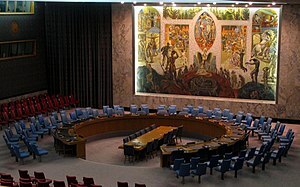 The United Nations Security Council (UNSC) is one of six main parts of the United Nations. The Security Council deals with maintaining peace and security between nations. If a country has behaved in a way seen as bad, the UNSC can make a ruling, known as United Nations Security Council Resolutions or sanctions. An example is that the UNSC has currently banned all imports of nuclear material to Iran as they feel Iran is going to make nuclear weapons. However, Germany has also conferenced with the permanent UN Security Council members about this issue. The United Nations Security Council (UNSC) is the most powerful part of the United Nations. The Security Council deals with maintaining peace and security between nations. ↑ "Members of the UNSC". United Nations. http://www.un.org/en/sc/members/. Retrieved 9 March 2014. This page was last changed on 12 August 2014, at 00:33.